Instant Bond Thin 2 oz. 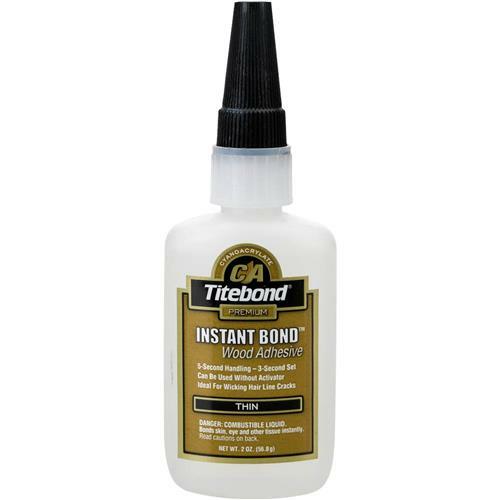 Titebond 6201 - Instant Bond Thin 2 oz. Due to DOT shipping restrictions this item cannot ship via air services, or to addresses outside the Continental United States and Canada. Titebond Instant Bond is a two-part bonding system that takes between 5-15 seconds to set and 30-60 seconds for initial cure. It provides a strong, permanent bond and is ideal for hard to reach joints or surface areas that are difficult to clamp. Designed primarily for wood and wood products, this adhesive is also very effective on a wide variety of materials and substrates.